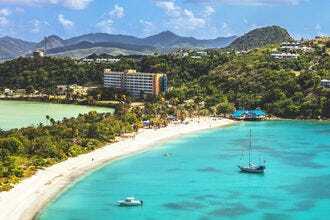 Beach junkies and sun lovers will find some of the world's most spectacular stretches of sand on the islands of the Caribbean. With so many palm tree-lined, silky sand expanses leading down to warm, azure water, it's hard to narrow it down to just 10. So we asked our readers for help. 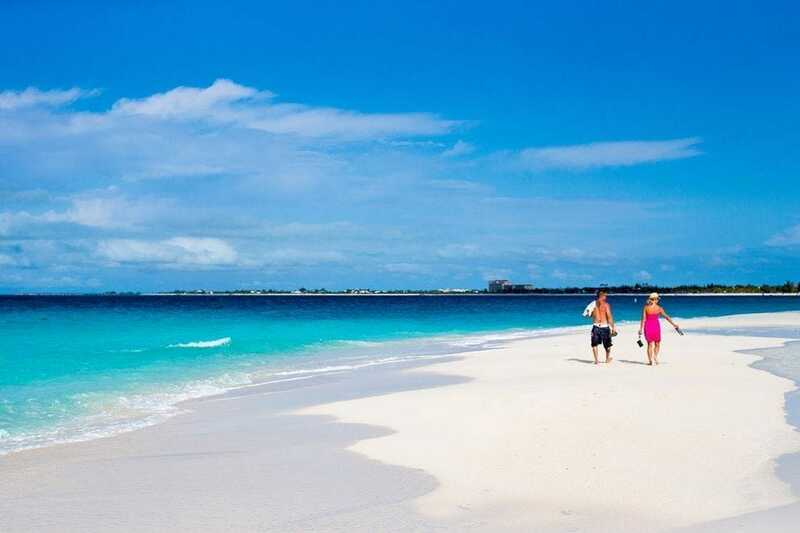 Located within the protected Lucayan National Park, Gold Rock Beach comprises a spectacular and secluded stretch of sand known as Grand Bahama’s “welcome mat.” Beach goers can make use of BBQ pits, picnic tables and benches, and at low tide, the sand stretches for yards out to sea. 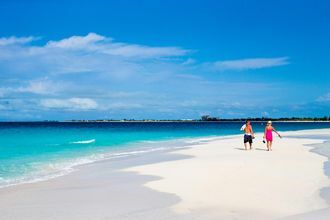 On the north side of Providenciales in Turks and Caicos sits 12-mile-long Grace Bay, a long stretch of sand lined with excellent resorts and tourist services. 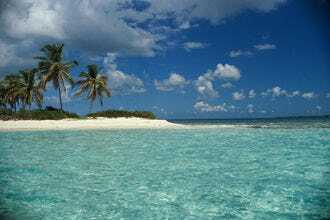 The endless (and unbelievably soft) white sand and mesmerizing turquoise water are often rather quiet, as there isn't a cruise ship in sight. Accessible by boat from Elizabeth Harbour, Stocking Island is ringed by white sand beaches, and just offshore lie blue holes, coral gardens and undersea caves perfect for snorkeling and diving. Many a visitor to the Caribbean's Spice Island never leave the 2-mile stretch of creamy white sand known as Grand Anse Beach. 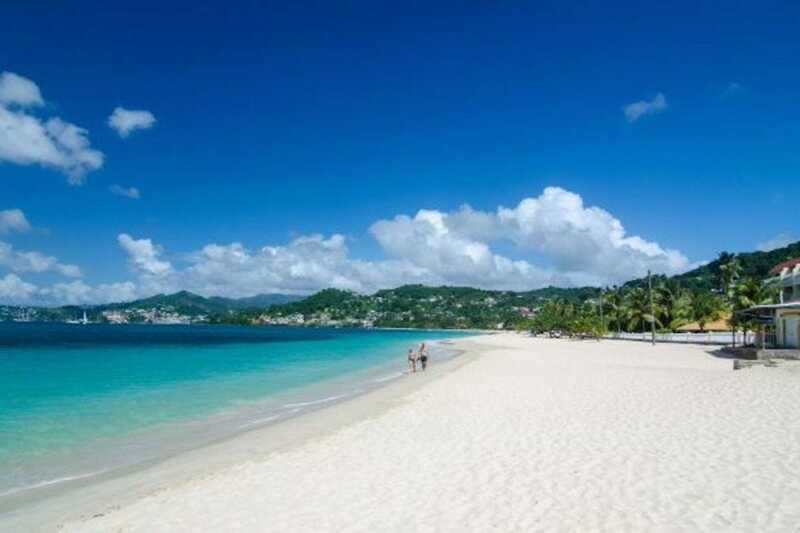 Located conveniently close to St. George's, the beach has an old Caribbean feel, plenty of room for walking and loads of restaurants, hotels and shops to meet any beach-goer's needs. 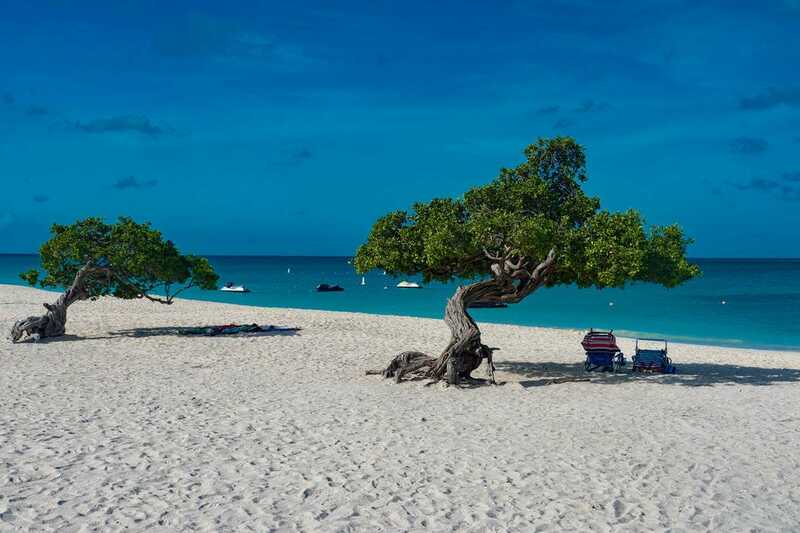 Aruba's widest beach is also one of its most spectacular, thanks to its blindingly white sand, warm Caribbean waters and some of the island's most famous (and photographed) fofoti trees. 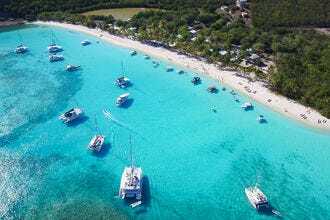 The waters of White Bay Beach on Jost Van Dyke in the British Virgin Islands are protected by an excellent snorkeling reef, accessible from shore. Between bouts in the water, beach goers can relax and one of several beach bars along the sandy stretch. 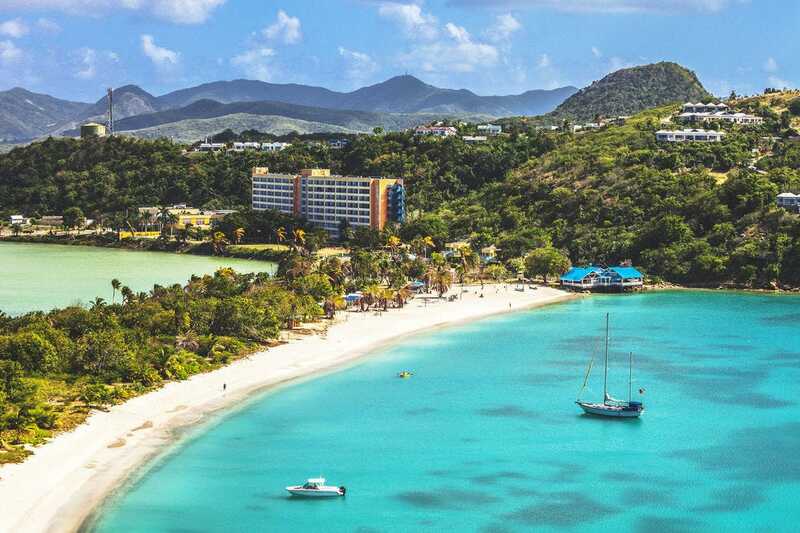 Situated on the north coast of Antigua, Dickenson Bay is a favorite for its white sand, shallow and calm waters, and the abundance of activities available – everything from restaurants to water sports. 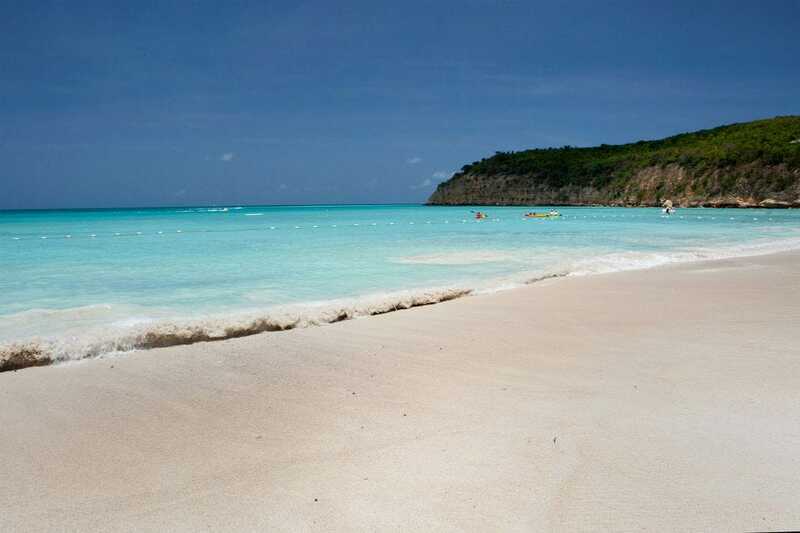 Situated on the western end of Antigua, Deep Bay features one of the island’s finest stretches of sand. The crescent-shaped beach fronts a wide, turquoise bay that’s home to the famous Andes Shipwreck diving site. A 10-minute trail from the sand leads to Fort Barrington. This beach on the southern tip of Elbow Cay features soft white sand shaded by coconut trees and clear, calm water perfect for swimming. It’s only accessible on foot or by bike or boat, and at low tide, its large sand bar is ideal for shelling. 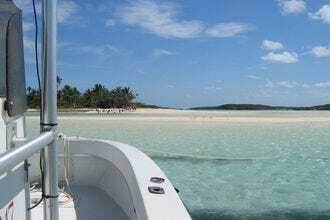 Paradise-seekers in Anguilla may just find what they're looking for on tiny little Sandy Island, a tiny speck of sand a short boat ride from the main island. With 360-degree ocean views, Sandy Island has its own seafood restaurant serving some of the best food around. 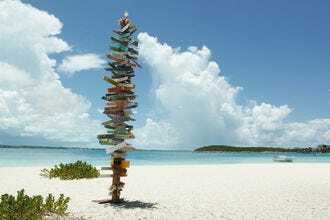 Congratulations to all these winning beaches!